This is not the reboot you’re looking for. Let’s just clear the air upfront dear reader, so we can work through this together. The emotional rollercoaster of Prey 2’s development struck a chord with me as the last hope for a return to the days of the classic FPS shooter. In many ways the original Prey (2006) was the high-water mark for the genre, in the closing days of the golden era in single-player FPS games, it introduced so many new game mechanics that it still stands on its own despite being presented in 4:3, and that’s a feat that few SP FPS games can claim. This new Prey might just stand on its own as a generic System Shock clone, and if it went with the title “Generic space shooter” I would have granted leeway in this review. But this game isn’t titled “Generic space shooter”, it’s called Prey, and it will be judged as such. If Valve released “Counter-Strike: Tactics” and it was a turn-based RPG, then I might have reservations, but I’d remain open-minded. However, if they released “CounterStrike” as a turn-based RPG, you’d better believe there would be some arched eyebrows. I will not conveniently ignore the legacy that the Prey IP carries in this review, but I’m not going to ignore all the things that the game gets right. It’s a balancing act, so we’ll see. 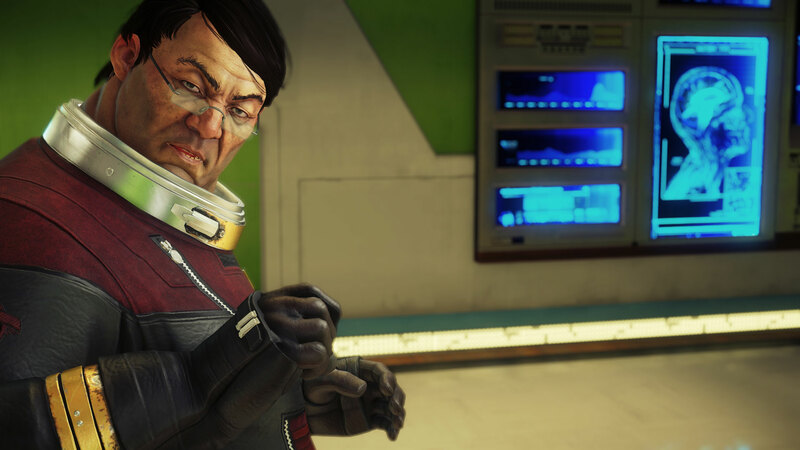 The first hour of Prey feels instantly iconic, even though it doesn’t draw on anything the series left us with at the end of Prey (2006). If Arkane managed to sustain this presentation throughout the game, it would easily claim GOTY without a fight. From the mindfuck psychological reveals to the emotionally-charged soundtrack, Prey 2017 makes a great first impression. You are Morgan Yu, the cleverly unisex-named silent protagonist that finds him/herself on board the orbiting space station Talos I. In short order you discover that you are no mere cog in the machine, you are one of the system architects of the neuro experiments housed aboard the station. It feels analogous to Gordon (Morgan/Gordon, coincidence? probably) Freeman being the one to initiate to resonance cascade deep in the desert tomb of Black Mesa. Morgan Yu is one of the driving forces behind the events unfolding on Talos I, the other being his brother Alex Yu, brilliantly portrayed by Marco Polo star Benedict Wong. Fun fact: Wong also appeared in the UK television crime drama “Prey”. After the hour-long introduction, you’re shat out into the space station to wander alone through *gasp* alien filled corridors as you wind your way through the several almost identical-looking sectors across the station. This is where the game enters the “slow burn” pacing phase, where plot progression moves at a snail’s pace, and major reveals are almost entirely MIA until the closing hours. Need an excuse to lead your protagonist through every broom closet on a massive space station? Keycards, lock codes, and similar tat is what you’ll expect to encounter time and time again. It’s so egregious that the current world record speed run Any% of Prey is around 7 minutes 30 seconds. This is because if you just follow the needlessly boring progression of requiring this keycard to get the next keycard, and that keycard to get the next door code etc. You’ll end up handing speedrunners a golden opportunity to no-clip between some walls, obtain the last critical item on this list, then just finish the game. With a runtime of approx 25 hours, 23 of them feel hollow and begging for an evolving storyline. Not that the original Prey (2006) relied heavily on plot development, but it absolutely dances circles around the empty-feeling Prey 2017. The bits that we do get to nosh on are satisfying but few and far between. I’ll say confidently that Prey 2017 is definitely a game where they came up with the ending first and then worked backwards to develop a story to fit. This shows with the barebones main portion of the game, but also reflects why the ending manages to shine so brightly. It almost makes slogging through the game worthwhile. It’s clever, original, and served with a twist. The twist you can anticipate if you’re eagle-eyed enough, but it’s so well done that the few clues to be seen are easy to overlook, leading to a genuine ear-to-ear grin at the final reveal. If you’re a fan of slowly piecing together a story through sparse interactions with a small cast of characters, audio logs, and a thousand e-mail terminals, then you’ll appreciate the light touch on storytelling, however, I found it entirely unsatisfying for the bulk of the playthrough. The e-mail terminals require a special mention, they’re strewn throughout the station with the possibility of a progression-enabling 4 digit keycode hidden within. The thing is, the keycode frequency dries up pretty fast, and I found myself slack-jawed at the inane babble that I was wading through in the hopes of some interesting plot or character development. For every e-mail discussing anything relevant to the plot, there’s 20 which are corporate employees are talking about what’s on the lunch menu at the cafeteria. These interactions attempt to draw us closer to the now-deceased cast of characters that once brought these alien-infested halls to life, but forcefully backfires. I wouldn’t find these characters interesting if they were alive, and now I’m snooping their e-mails like I’m stalking my ex’s twitter feed after she’s dead? She woke up today, drank some orange juice, and bitched out her boss to a fellow employee, brilliant. I’m possibly the greatest scientist the world has ever known, stuck trying to save a massive alien-infested space station orbiting the moon, and I’m spending my time stalking the impersonable ghosts of water-cooler gossip. When the plot does decide to rear its head, it is actually engaging, and deserving of its own IP. But this way the game makes you slog through so much white noise to find any fulfilling piece of meat is insulting to the pacing of its predecessor in the franchise. In the interest of saving my word count to talk about more interesting aspects and comparisons of gameplay, I’ll be brief with my summary. Have you played BioShock or SystemShock? If so congratulations, you can probably guess 90% of the gameplay elements of Prey 2017. It’s not just the limited ammunition and survival horror vibe, it’s also the special abilities you gain through Psionic Disciplines, no wait that was System Shock. You gain new powers through Plasmids, no wait that’s Bioshock. 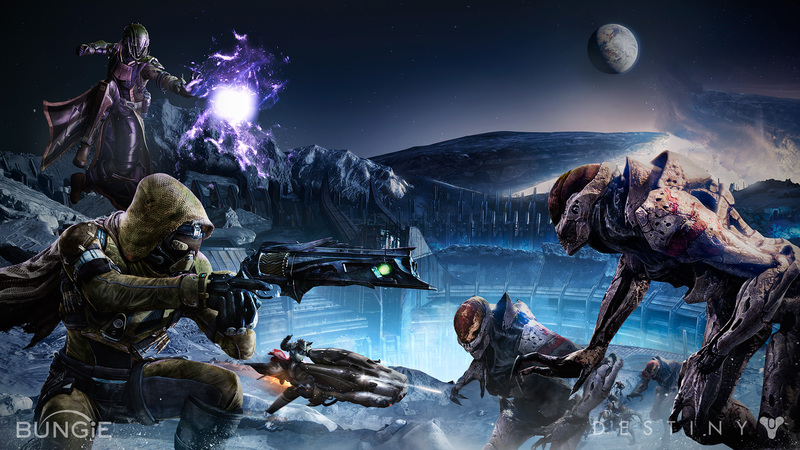 You gain powerful new capabilities through an entirely original system called NeuroMods, that’s the one. Hacking turrets and robotics? Check. Find the door keycard or find the air duct to crawl through to progress the storyline giving a sense of choice? Check. 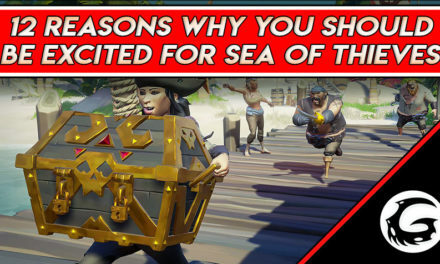 Plenty of back-tracking through the maps to prolong the experience? Check. It really is an utterly cookie-cutter plagiarism of the “Shock” series, so let’s focus on the few elements that are new. One of the first weapons you stumble upon is the GLOO cannon, which shoots blobs of fast-hardening goo that can temporarily incapacitate enemies lining them up for a quick melee to the face. However, you can use the GLOO cannon to build makeshift platforms to help you climb up otherwise inaccessible walls. It’s pretty fun, and I wish there were more excuses to use this new gameplay element, as it was satisfying when applied to figure out solutions to obstacles. 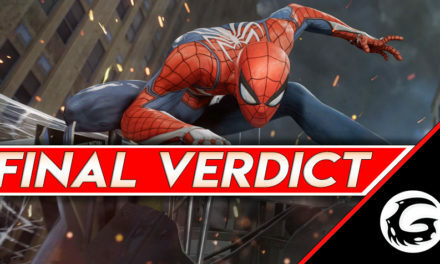 And that’s about it for new gameplay, I’m sorry if you feel betrayed by my tone signaling that there was a long list of new elements to dig into, there isn’t. Now let’s compare the gameplay to Prey (2006), and this is where the distinctions couldn’t be starker between the original title and this abomination. Yes, an abomination. Arkane has taken what could only be described as the most rewarding game loop in SP FPS history and shot it dead, burned the body, and then pissed on the ashes. In Prey (2006) you never really died, but you still played like every HP was your last. They didn’t rely on a Halo-esque recharging shield mechanic that bastardized the SP FPS genre into cautiously peeking around corners and then cowering in fear. No, Prey (2006) found a mechanic that to my knowledge hasn’t been used since, and it’s a shame no one has. Playing into the lore of Prey (2006) which revolves around Native American culture, when you die in-game you warp to a spirit realm with wraiths circling overhead while you’re slowly sucked into a vortex in the middle of the map. You’re armed only with your spirit bow (Prey 2006 did the whole bow and arrow thing before it was cool) and your limited time is spent trying to take down as many of the flying wraiths as possible before you’re sucked into the portal. For every red wraith you smite, you’ll respawn with more HP, for every blue wraith you lance you’ll spawn with more spirit energy. Once the gravitational pull of the vortex in the middle of the map is too great to escape, you’re sucked in and spat out back into the game world where you just died. This completes the death-loop mechanic, and in effect means that there’s never any downtime. While you’re alive the action is frantic, and when you’re dead you’re scrambling to make a grand return to the land of the living. This did away with checkpoint-to-checkpoint gameplay, and totally eliminated the need for the most outdated death mechanic, the quick save/quick load loop. Prey 2017 on the other hand, well let’s just say that if the game would let me rebind all the keyboard keys, my first key mod would have been binding F5 and F9 to my two mouse buttons, as I literally used those more than the left mouse button during this game. That is not an exaggeration. You’re perpetually hurting for ammo in Prey 2017, that to play through an encounter where it took one shotgun blast too many to kill an enemy, you’d be a fool if you didn’t quick load and play through that encounter over again. It was not uncommon at all for me to have 4-5 quicksaves while clearing just one room of baddies. It felt like I was forced to play essentially a tool-assisted time run, loading savestates and making sure that every encounter went just right. I mean, I’d just melted down 30 items I’d collected into the recycler to make 12 shotgun rounds, I was going to make them count. After all, it took about 30 minutes of game time to be able to gather all that loot just to smelt me some scattergun pellets, they were going to work for me. Prey (2006) meanwhile gave you the main alien weapon in the first playable level which slowly regenerates ammo if you completely run out. Oh, and it can be used as an assault rifle, or in a sniper 1HK headshot sniper configuration. 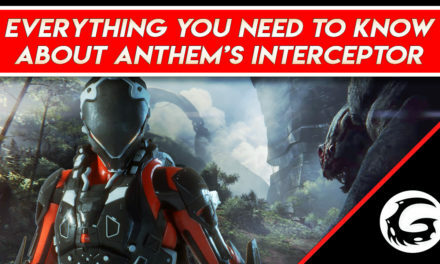 You know, because you’re probably more interested in exploring the mind-bending alien ship and blasting baddies than collecting scraps and reading office e-mails. Speaking of mind-bending gameplay, Prey (2006) introduced us to portals before “Portal” was conceived. It also gave us several head-trips by allowing you to change the gravity direction on a whim to cater to three-dimensional puzzles and activating gravity walkways to let you walk on the ceiling. And since we’re on a roll here, Prey (2006) also gave us the infamous miniaturization of meteoroid fragments which then became whole planets, taking the shink-ray from Duke Nukem 3D to brave new places. 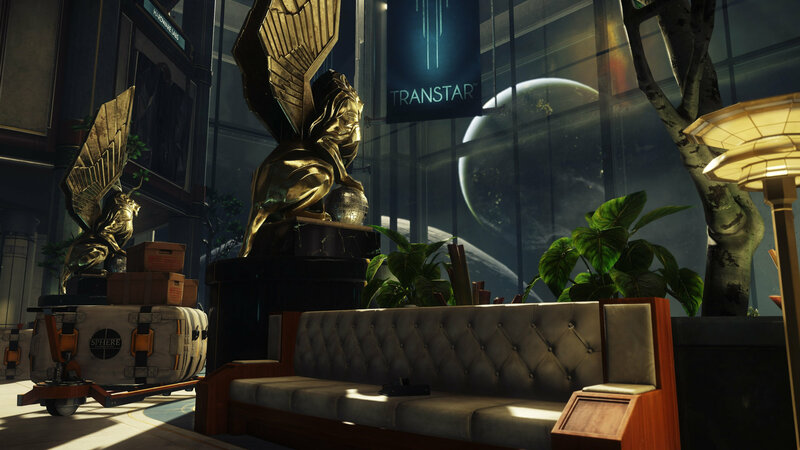 Prey (2006) introduced so many new mechanics, it really made your head spin. 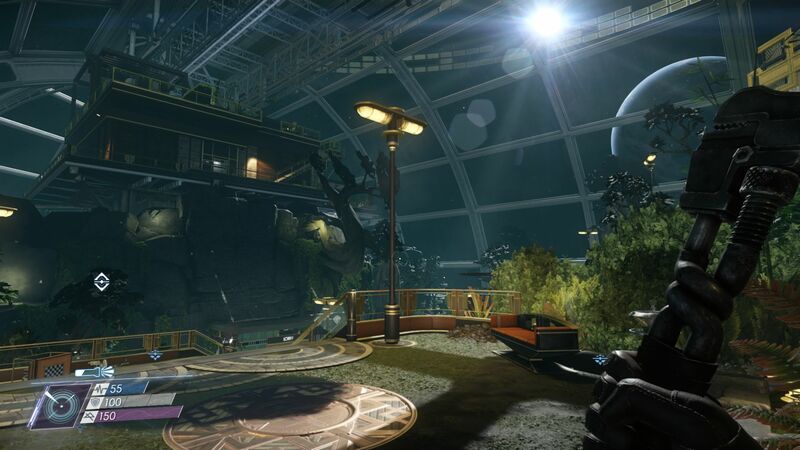 Prey 2017 has the GLOO cannon. For all the fuss about giving you so many (mostly useless) abilities in Prey 2017, you’re almost never forced to use them to progress. The often showcased ability to turn into a coffee mug to get through a small wall opening turned out to be impotent in practice. In these scenarios, there was always a semi-blocked doorway 3 feet to the left where I could just use my mighty power of “Leverage I” to lift a small box obstructing the doorway. There are no environmental puzzles anything close to what Prey (2006) provided in its first 2 hours, let alone the masterful manipulation of playable space through the creative use of wall-walking, shrinking, gravity manipulation, and portals. 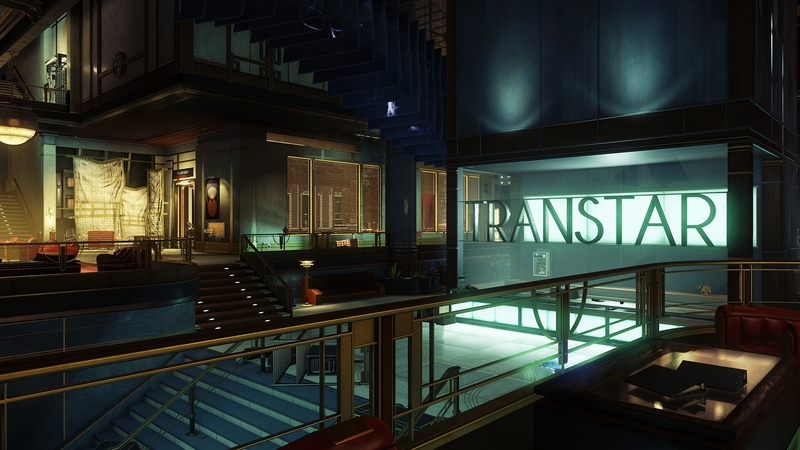 At best in Prey 2017, there’s an alternate route to get into the next room if you have bought the skill “leverage III” to be able to pick up and move a sofa to reveal an air duct. It’s appalling how far the level design has fallen into utterly predictable territory in 11 short years. 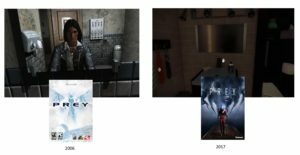 Prey 2017 leaves a lot to be desired in the visual department. While some of the design elements are crafted with loving care, the overall experience feels instantly dated. Yes, you can fly outside of the space station, but 99% of the game is in tightly-packed corridors with the odd medium-sized area to stretch your legs in. This game was not built as a demanding testament to 2017 technology, it’s an appeasement of the Xbox 360 era. The textures work is decent, but without creative uses of lighting and shaders to make them pop leaves them feeling at best uninspired and at worst dull. Overall this doesn’t feel like the visual presentation that we should be expecting in 2017. The most egregious example of this (get ready for another potshot) is that there are no mirrored surfaces. 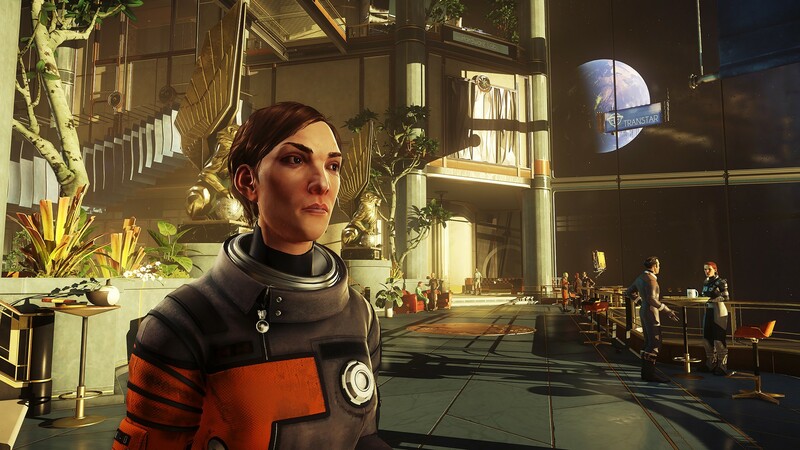 Right after the opening fade of Prey (2006) we see our protagonist looking into a mirror and we see ourselves in splendid glory, and this was using the Doom 3 engine (ID Tech3). Literally, the first thing I did in Prey 2017 when I claimed control of my character was to dash to my bathroom and stare into the mirror, it just seemed right. Much to my dismay, all I saw was a barely distinguishable “metallic” texture that felt like it was plucked from a pre-made texture asset box. It was opaque and didn’t reflect anything, although I could instinctively feel that my character’s expression reflected utter disappointment. I don’t think the following is a nitpick so much as a pulling-my-hair-out moment that I encountered several times in the game, let’s say just about… well… precisely every time I engaged an enemy. The black aliens creepazoids do this… thing, to my screen, whenever one of them gets angry at me. It’s hard to describe, so just imagine that you’re looking at a well-defined chair in a well-lit room. Now squint, good. now turn off all the lights in the house save one, great. Now find an old-timey fountain pen, snap it in twain, and rub the ink all over your eyeballs, wonderful! I’ve just painted you a word-picture of the graphical effect that happens anytime you engage an enemy in Prey 2017. The tone-mapping of the game becomes ridiculously dark, even with gamma cranked to max it’s hard to see anything. Small crab-like facehuggers are jumping all around you while you try desperately to swat them away with a wrench (because you wouldn’t want to waste those precious shotgun shells) while the #1 thing you can accurately make out on your screen is the abundance of black crush. And then on top of that, there’s a layered addition to the HUD as if the ketchup-screen from CoD was replaced with printer toner. Inky screen, so real! Whoever thought that this “effect” was a good idea needs to consider another line of work. And let’s have an honorable mention for the field-of-view. On the PC version, you’re locked to a console-esque FOV of, well, let’s say about 2. Because trying to swat away facehuggers in near-darkness is much more fun when you have an FOV of 2. So intense, so real! To the game’s credit, there are many graphical options (although even with all of them set to max it doesn’t make mirrors reflect light), unfortunately, none of them control the field of view. The official launch-day response from Bethesda was instructing PC users to manually edit .ini files to change the FOV, which PC gamers aren’t afraid of, but it still comes off as a huge oversight. I have a love/hate relationship with the audio from Prey 2017. In some instances, the score reinforces what little exposition there is to make it feel more impactful. I almost feel like I’m being swept away in a moment where the game recaptures the awe of the first hour’s introduction (the musical score contributed heavily to my impressions of said first hour). On the flip side we have the entirely too-busy soundscape of SFX during the alien encounters. It feels like the sound designer was given free reign to unleash their inner movie trailer producer. The SFX palette is sonorously textured to stand its ground firmly if it’s the only sound being played. The problem that arises is when you have 4 aliens emitting these sounds at the same time, then layering that with the different powers they use, your powers, and the whole soundscape turns into a mess very quickly. My advice to the designers would be to either isolate the different SFX by frequency range, so there isn’t so much cross-talk, or just make them more compartmentalized in other ways. Alien encounters can sound like a DJ mashing up 5 Skrillex songs at once. One at a time is great, 5 at once is just a mess. Not only that, but given that you only have sight and sound to determine your spatial orientation in a video game, when one of them is just a mess, it only heightens the sense of confusion and frustration. This could have been done as an artistic choice, if only because it’s just as disorienting as the inky black crush screen of doom on the visual side. The problem is they’re both bad artistic choices in my humble opinion that only further the annoyance of trying to track the action happening while not wasting any precious ammunition. If the game was forgiving instead of punishing with ammunition I might say that the aural presentation was justified, as the skill would come from trying to identify the different sounds while blasting away happily. Unfortunately, there is a distinct conflict between these two mechanics that, much like the sound design, try to occupy the same space at once. I can’t be sure if Arkane was working on an original sci-fi generic SystemShock clone, and then Bethesda remembered that they own the IP rights to Prey, or if this was actually designed from the early stages as a Prey title. I have to hope for the former rather than the latter, as the former would only indicate corporate negligence, while the latter tells us that this was the murder of a glorious IP with malice aforethought. 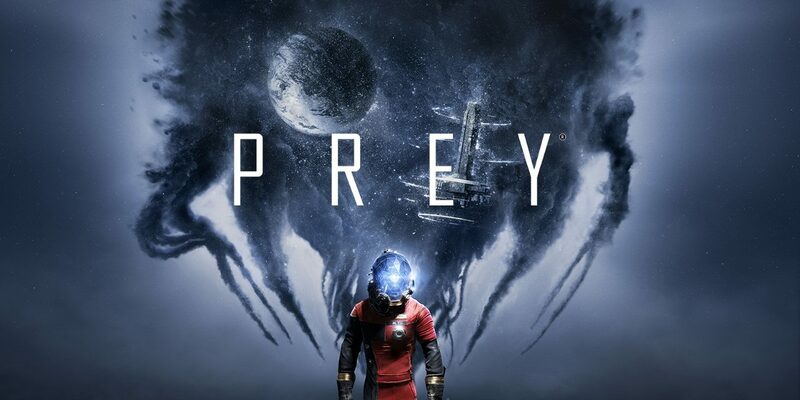 I like the work Arkane has done with the Dishonoured series, and it saddens me to knock them down a peg for this “Prey” title if it can so be called. But there’s no escaping the elephant in the room. 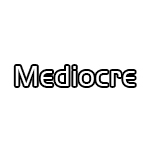 If this game was called “Generic System Shock Clone” It would have earned itself a solid 6/10, good, not great. However, considering the ramifications of utterly destroying this IP they should be happy they squeaked by with a 5, which they only earned because of a genuinely good ending. It almost makes you forget the 25 mediocre hours of transplanted gameplay into a game that didn’t need it. If they had only re-introduced us to the mechanics that made Prey (2006) such a hit and expanded upon them, they would have had a GOTY on their hands, instead, we’re left with a shambling corpse of broken dreams and defiled legacies. Fragging since ’92, our resident FPS junkie aims to use the megaphone of journalism to keep the kids off his lawn. He’s definitely bitten off more than he can chew, and he’s all out of gum. The mantra: “Speak softly, and carry a big AWP” illustrates his propensity to shake off all the mortal trappings of this life in exchange for “the win”. It’s true, in the wake of this unrelenting gaming addiction lies the scattered remains of loving relationships, gainful employment, and personal hygiene. One could almost say he held the high score for the destroyed dreams of an unplugged life. Society’s loss was gaming journalism’s gain.